I’d always been happy enough watching the Rose Bowl on TV. Wherever I was on New Year’s Day it had been gray, gloomy, and cold. In Pasadena, site of the Rose Bowl, it was invariably warm and sunny. Just the sight of those football fans basking in that southern California sun was enough to lift my spirits. Max hadn’t gone to Washington but he was an avid fan. He listened to Husky podcasts and he read a lot about the team. And he had a point: no telling when Washington might get back to Pasadena. 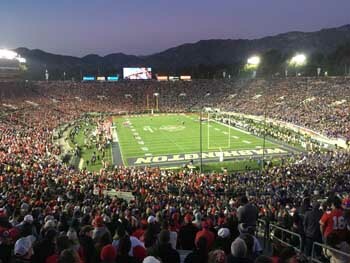 This year, the game was special for another reason: for almost a century, the Rose Bowl, the oldest college football bowl--the “Grandaddy” of bowl games--had matched the champion of the PAC 12 conference against the champion of the Big 10 conference. In recent years, that rivalry had diminished due to the disruptions inflicted by the college football playoffs. This year, though, it worked out that the PAC 12 champ would play the Big 10 champ again. It was like a return to the days when the Rose Bowl’s history and tradition had made it special. But I balked. True, I lived in northern California now, only 300 miles north of Pasadena. But the hassles: getting game tickets, a round trip flight to southern California (easier than fighting southern California traffic), getting a motel, transportation from the motel to the game. It seemed like a lot of trouble and expense for a couple hours of football. Still, it was Christmas and close to Max’s birthday. So after stalling awhile, I gave in. It’d be Max’s birthday present. It was just as well. It would cost plenty just for me and Max, and I knew Mardena would dislike all the travel complications. I sent off for two tickets. Max, as it turned out, would be in San Diego with his girlfriend over the New Year. He could drive the two hours up north on the day of the game, pick me up at my motel, and drive us to Los Angeles’ Union Station where we’d catch a commuter train to Pasadena. Unfortunately, I’d forgotten that another major event, the Rose Parade, would take place in downtown Pasadena the morning of the game. That, I didn’t doubt, would add another layer of logistical misery. I knew the tickets wouldn’t be cheap, but when they came it was still a jolt: face value $160 each, $360 each once taxes, fees, and the middleman’s cut were tacked on. Someone, I thought, is making some money here. My flight to Burbank airport was painless, and my room at the Burbank Quality Inn was pleasant enough except that the motel was squeezed into a noisy intersection just off Interstate 5. A Jack in the Box next door was the only eating option within blocks. The morning of the game, Max picked me up early. We drove to LA, found an underground parking lot, and started toward Union Station on foot. The streets were deserted except for homeless people sacked out in parking lots and building entrances. On the train to Pasadena, Max chatted with three friendly Ohio State fans, two men and a woman in their 30s. I couldn’t hear much of what they were saying, except that they were from Pittsburgh. In Pasadena, the Rose Parade had ended. What was left was debris--sidewalks littered with Starbucks cups, crumpled sheets of paper, splashes of coffee, and overflowing trash cans. A few stragglers were hanging around alongside their barbeque grills, propane stoves, sleeping bags, and an occasional mattress. Storefronts were boarded up for the day with plywood sheeting. “It looks like the apocalypse,” Max said. He stuffed his coffee cup into a trash bin and walked off to find a porta potty. So far, the experience was living right down to my expectations. After awhile we left the downtown, following a stream of pedestrians headed toward the stadium. Crossing a maze of freeways, we eventually came to an open grassy area filled with partying tailgaters. Straight ahead was the stadium, cream-colored, with “Rose Bowl” and a bright crimson rose over the main entrance. We went in and found our end zone seats. The bowl was filling slowly, red-clad Ohio State fans to our left, purple clad Husky fans to our right, and an immaculate playing field of genuine grass (a rarity in football these days) between them. Beyond the far end of the stadium was the iconic Rose Bowl setting I’d seen so often on TV: leafy trees, graceful palms, the dusty, sun-baked San Gabriel mountains, and a deep blue sky. The temperature was warming into the 60s. The game itself started about like Max and I had expected. Although they’d won the Pac 12, Washington’s season had been a disappointment. Something better than a 10-3 record had been expected of them. It seemed obvious that Ohio State, at 12-1, was the better team. And sure enough, Ohio State scored quickly, jumping to a 21-3 halftime lead, completely outplaying Washington. The way things were going on the field, a minor drama in the stands was taking on as much interest for me as the game. Every time Washington screwed up, which was often, a young Ohio State fan seated two rows below us cackled loudly with amusement. When Ohio State made a good play, which was also often, he stood up, turned to the crowd behind him, and flamboyantly signaled a first down. He was up and down a lot during the first half. Early in the second half, Ohio State scored again to make it 28-3. That prompted an Ohio State fan along the bleachers to our left to jump to his feet, turn our way, and yell, “Why not leave now and beat the traffic?” If the game hadn’t been such a beat-down, I probably would have appreciated the humor. The capper came at the end of the third quarter when a river of fans wended its way down to the concession stands. One of them, a young guy impossible to miss, had “Ohio Against the World,” emblazed in big white letters on his red sweatshirt. It set me to wondering: Is it my imagination, or is there some undercurrent of resentment here? But directed at what? Washington? Not likely, the state was too obscure. California, with its benign weather and this gorgeous setting?—maybe something along the lines of, “Well, you might have this, but we have a better football team!” Or was it directed at the Left Coast in general? The Ohio State fans on the train had been thoroughly amiable; these guys seemed defiant. Finally, in the fourth quarter, Washington woke up, stopping Ohio State repeatedly, scoring twice themselves, and making it 28-17. Max was woofing heartily. The cackler looked grim. I was pleased, spitefully so; the guy’s discomfort almost made the disappointments of the first three quarters worth it. With a couple minutes left, Washington scored again to pull within 28-23. The cackler had disappeared. But Washington ran out of time. That’s how the game ended. Max and I left the stadium and started back downtown. The loss was disappointing, we agreed, but Washington had at least made the game interesting. I actually felt some pride; the team’s comeback must have at least punctured the complacency of those obnoxious rub-it-ins. For me, though, the experience was about more than the action on the field, anyway. It was about the pleasure of attending an event I’d enjoyed at a distance for years. It was about the return to tradition that made this year’s Rose Bowl special. And it was about the beauty beyond the stadium as the bright colors of the afternoon transitioned into the darker, softer tones of evening. Still, as we tramped back through downtown Pasadena, my burst of enthusiasm surprised me: “That was great,” I said. “I’d do it again.” For Max, it went without saying. “Me too,” he said.